Good pair of walking shoes, [Mountaineering boots very good athletic shoes] Small backpack for personal items on our hikes, a jersey to change, waterproof jacket, hat, bottle of water 1. liter, baton [sticks], some snack for energy [pastel, nuts, dried fruits energy chocolate bar, camera, appetite for walking and good mood! Interested parties wishing to participate should contact us by phone (+30 6949 650 300), via e-mail (info@traceyoureco.gr) or by posting a message on Facebook to check the availability and participation statement. Where can I view the available tours? Our excursions are published at traceyoureco.gr on the Hiking Tours page and on our Facebook page. There you can choose your own package between one-day, multi-day, school or corporate tours, and you can see the level of difficulty, the cost and material of the excursion. Where can I contact Trace Your Eco? Before each trip, you fill out the form of the responsible statement with the details of the particular tour you are participating in and you accept the following terms. I declare responsibly that I have never encountered any health problem, indicatively stated such as heart related issues etc. I have never been under treatment for hearth incidents, diabetes, neurological and psychological disorders and I have never been aware of any other health problem that would prohibit or restrict my participation in mountain related activities or any other athletic activity. I have informed about any health issues that can affect my performance and safety during the activities, indicatively stated such as allergies, taking medicine and special pills. I am aware of the requirements and the risks of the activity(ies) I am going to participate and I undertake full responsibility for my participation in the activity, accepting the risks and the responsibility of my safety. I have the necessary skills, knowledge, experience and equipment for my participation during the activity. 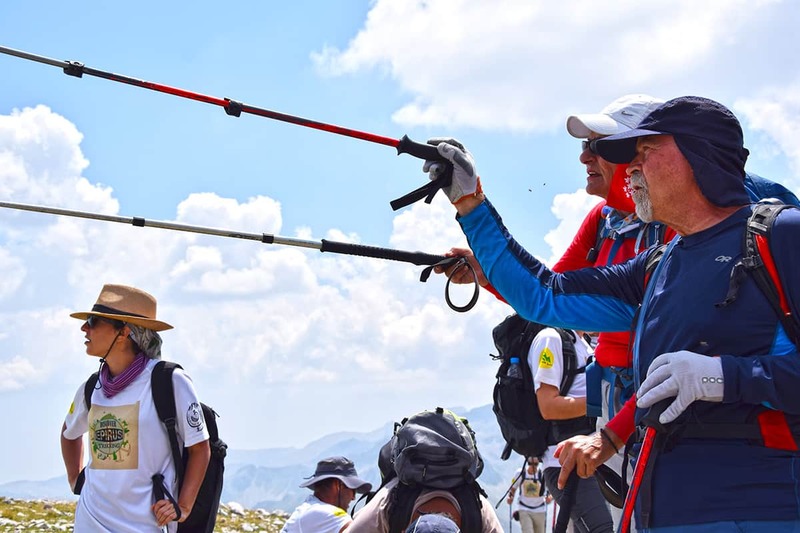 By participating in the hiking tour/-s which will be held by Trace Your Eco, I accept unreservedly that I carry the responsibility in case of an accident which is due to my fault and I resign from any kind of claim towards Trace Your Eco and its guide(s). To avoid any incident and/or problems I will follow and apply strictly the directions given by the team leader and I will not diverge from the course of the team. These terms and conditions govern the use of this site. By using this site, you accept these terms and conditions fully. If you do not agree with these terms and conditions or any part of these terms and conditions, you should not use this site. You must be at least 18 years old to use this site. By using this site and agreeing to these terms and conditions, you warrant and represent that you are at least 18 years of age. Unless stated otherwise, TRACE YOUR ECO and / or its licensors own copyright on the site and site material. Subject to the license below, all intellectual property rights are retained. You may view, download only for cache purposes, and print pages or any other content from the site for your own personal use, subject to the limitations set forth below and elsewhere in these terms and conditions. Re-publish material from this site (including republishing on another site). Publish any material from the site. Reproduction, copying, copying or otherwise exploiting material on this site for commercial purposes. You redistribute material from this site, except for content that is specifically and explicitly available for redistribution. You must not use this site in any way that causes or may cause damage to the site or affect its availability or accessibility, or in any way that is illegal, fraudulent or harmful or in connection with any illegal, fraudulent or harmful purpose or activity. You may not use this site to copy, store, host, transmit, send, use, publish or distribute any material consisting of or associated with any spyware, computer virus, Trojan horse, worm, typing logger, rootkit or computer malware. You should not perform systematic or automated data collection activities including but not limited to data extraction and data collection on or in connection with this site without the express written consent of TRACE YOUR ECO . You should not use this site to transmit or send unwanted commercial communications. You should not use this site for marketing purposes without the express written consent of TRACE YOUR ECO . Access to specific areas of this site is limited. TRACE YOUR ECO reserves the right to restrict access to other areas of this site or the entire site. If TRACE YOUR ECO gives you a user ID and password to allow you to access restricted areas of this site or other content or services, you must make sure that the user ID and password are kept confidential. TRACE YOUR ECO may, at its sole discretion, disable your user ID and password without notice. In these terms and conditions, “user content” means material (including, without limitation, images, images, audio, video and audiovisual material) that you submit to this site for any purpose. Provide TRACE YOUR ECO with an irrevocable, non-exclusive, royalty-free license to use, reproduce, adapt, publish, translate and distribute the content of the user on any existing or future medium. Also provide TRACE YOUR ECO with the right to sue for violation of these rights. Your users’ content should not be illegal, should not violate the legitimate rights of third parties. You must not submit any user content to the website that is, or has ever been the subject of, threatened or actual legal proceedings or other similar termination. TRACE YOUR ECO reserves the right to edit or remove any material submitted to this site or stored on TRACE YOUR ECO servers or to be hosted or published on this site. This site is provided “as is” without express or implied warranties. TRACE YOUR ECO makes no representations about this site or the information and materials provided on this site. The information on this site is complete, true, accurate or not misleading. Nothing in this site is, or will be, advice of any kind. For any business loss, loss of revenue, income, profits or expected savings, loss of contracts or business relationships, loss of reputation or goodwill or loss or corruption of information or data. These limitations of liability apply even if TRACE YOUR ECO is explicitly informed of the possible loss. By using this site, you agree that the liability limitations set forth in this disclaimer of the site are reasonable. If you do not think it’s reasonable, you should not use this site. You agree that, as an association, TRACE YOUR ECO has an interest in limiting the personal responsibility of its members and employees. You agree that you will not personally appeal against its members or employees for any reason whatsoever. If any provision of this site’s disclaimer is certain to be invalid under the applicable law, this will not affect the validity of the other provisions of this Site Liability. Without prejudice to other TRACE YOUR ECO rights under these terms and conditions, if you violate these terms and conditions in any way, TRACE YOUR ECO may take appropriate action to counter the breach by forbidding access on your site by preventing computers using your IP address from accessing the site by contacting your Internet Service Provider to request to block your access to the site and / go against you. TRACE YOUR ECO may revise these terms and conditions at any time. The revised terms and conditions will apply to the use of this site from the date of publication of the revised terms and conditions on this site. Check this page regularly to make sure you are familiar with the current version. TRACE YOUR ECO may transfer its rights and / or obligations under these terms and conditions without giving you notice or giving you your consent. If any provision of these terms and conditions is determined by any court or other competent authority to be illegal and / or invalid, the other provisions will apply. If any illegal and / or invalid provision would be legal or enforceable if a part of it was deleted, that party will be deemed to be removed and the rest of the provision will continue to be valid. These terms constitute the overall agreement between you and TRACE YOUR ECO in relation to the use of this site and replace all previous agreements regarding the use of this site. These terms and conditions will be governed by and construed in accordance with Greek law and any dispute relating to these terms and conditions will be subject to the exclusive jurisdiction of the Thessaloniki courts. In addition to the limited license granted to you in the preceding paragraph, traceyoureco.gr does not give you any express or implied right or license under any patents, trademarks, copyrights or any other intellectual or other intellectual property rights. You may not mirror the contents of this site on any other website or any other medium without the traceyoureco.gr source being indicated. This site may provide links or references to websites or other sources other than traceyoureco.gr. Traceyoureco.gr makes no representations, warranties or other commitments regarding any sites not linked to the site or other sources of third parties for whom there may be referrals, access or interconnections from any traceyoureco.gr website. In addition, traceyoureco.gr is not a party and is not responsible for any transactions you make with third parties, even if you have been informed of the existence of such third parties (or have used an interface to such third parties parts) via a traceyoureco.gr website. As a consequence, you accept and agree that traceyoureco.gr is not responsible for the availability of such external sites or resources and that it is not responsible for any content, services, products or other materials that are or are available on these websites or sources. When you visit a website that is not traceyoureco.gr, even if it contains the logo of traceyoureco.gr, please be aware that it is independent and that traceyoureco.gr does not control the content of this site and is not responsible for any alteration in the content of the texts. It is up to you to take the necessary precautions to protect yourself from viruses, worms, trojan horses and other potentially harmful programs and protect your information in the way you think the most appropriate. You explicitly forbid any article republishing of content itself or descriptive without the inclusion of an active source in the article.